Strom Thurmond’s Lee Sawyer added another milestone to his coaching career last Friday night with the victory over Swansea. The Rebel Head Coach now has 100 victories. Coach Sawyer took over the Rebel program in 2004 and has taken the team deep into the playoffs every year including a AAA state championship in 2005. Willliam Yonce, son of Lauren and CeCe Yonce of Saluda, South Carolina, was ready with his magic marker last Friday night as 99 rolled over to 100. 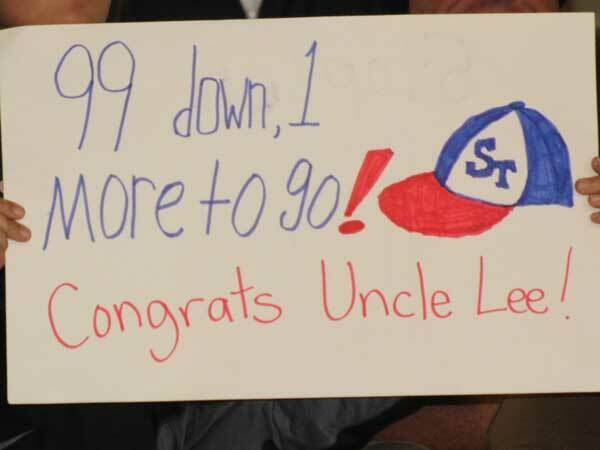 William, Coach Lee Sawyer’s nephew, has been in attendance at many of his uncle’s wins through the years, and was there with his sign to celebrate the milestone.